With the four major sports leagues all concluding their annual drafts, the lives of teenage prospects will change forever. In boxing, even the brightest of prospects spend years penny pinching before they even sniff a life changing payday. For every fighter that becomes a world champion and makes millions upon millions, there are a hundred fighters who fall victim to the bright lights, bad breaks and the snakes of the boxing world. For those who do make it, it’s usually years of fighting in small venues, on undercards, with little to no fanfare or media presence. On this list we’ll highlight 10 fighters who are on the cusp of superstardom – all 21 years or younger. Will these young sluggers live up to the hype? 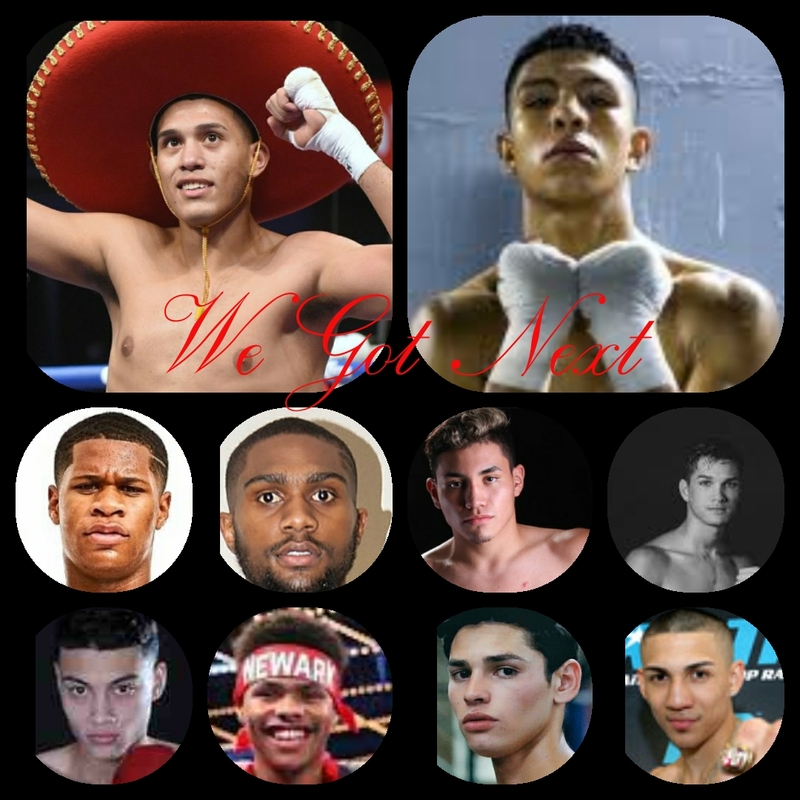 Or will they become the next Ricardo Williams or Panchito Francisco Bojado? The odds are stacked against them, but they are equipped with the God given abilities to achieve the highest accomplishments the sport has to offer. Lopez is a star in the making! He’s young, charismatic and explosive. In his previous outing, he starched Vitor Jones Freitas in one round before hitting the Fortnite celebration dance. Lopez possesses a combination of both speed and power, and has a fan friendly style. Fans and TV execs are excited about the future of the young, budding star Lopez. Lopez isn’t moving quietly either, he’ll face once beaten contender, William Silva on July 14 on ESPN for the vacant WBC Continental Americas title. Look for Top Rank to keep Lopez active, while building his resume and fan base for a title run in 2-3 years. Garcia has been moved slowly and properly by Golden Boy Promotions. He took a major step up in competition in his last fight against former world contender Jayson Velez. Although it wasn’t the exciting performance everyone was expecting, it was still one-sided in Garcia’s favor. Now he sets his sights on starring on the undercard of Canelo-GGG 2 in September. A huge stage for Garcia to bolster his fan base. Not only is Ryan Garcia a hit in the boxing ring, he’s a social media kingpin. Garcia is ultra-talented for only being 19 but he has many flaws in his game. However, he gets it. He understands that in order to become a household name, your presence needs to felt and heard. He also understands that it takes as many doubters, as it does supporters, to become a mega star. Garcia is a year, if not two, away from challenging for a world title. However, he draws bigger crowds than most current world champions do. Stevenson is a superior athlete and gifted boxer. He’s equipped with all the natural abilities and has shown glimpses of having those next level abilities. He at times seems bored in the ring and it probably stems from the competition he has faced. Most fighters of his caliber have all went through that phase only to become showstoppers when the competition becomes greater. We’ll see how Stevenson rises to the occasion. Stevenson probably has the most pressure upon his shoulders due to his amateur career, promoter backing and media hype. Although he has garnered the wrong attention in recent times, Stevenson has a strong team behind him. He has a bright future ahead of him and the best promoter in the game. Unless the plans change, or Stevenson asks for a speed up in the process, I don’t see him contending for a world title for at least 2 years. The Golden Boy prospect was a budding amateur star destined for the 2016 Olympic team. However, he decided against the games and turned pro instead. It was a calculated move but it has definitely paid off as Golden Boy is moving Tanajara at an accelerated pace. The San Antonio product is becoming a fan favorite in the southwest region as being featured on the popular LA Fight Club series. HBO execs will get a closer look at him when he fights on the Jaime Munguia card next week. Tanajara has that Diego Corrales build – tall and lanky – but is willing to mix it up. He doesn’t have ‘Chico’s’ power, yet, but he’s gifted just like the late, great Diego. He’s scheduled for his fourth bout of the year on the 21st, and barring an injury or upset, it’s easy to assume he’ll be back for a fifth time in 2018. Tanajara could easily be competing for a contender spot by the end of 2019. Figueroa has the fighting bug in his blood. He is the younger brother of former world champion Omar Figueroa Jr. After only 40 or so amateur fights, Figueroa turned pro in 2015 and has complied an impressive record to date, beating fringe contender Fatiou Fassinou in only his 13th bout. The PBC product has been inactive of late with only one fight in 2018 and nothing locked in on the schedule. At age 20 though, a fighter can use a break to heal the aches and pains of this rigorous sport. Figueroa is at least two years away from making any legit noise in the featherweight division. The Mexico-based Hernandez is a knockout machine – for only being 20. He’s currently the WBC Super Featherweight Youth Champion, and will defend his title on July 14 against Marlyn Cabrera. Look for Hernandez to make a big statement and rack up another exciting knockout. Promociones del Pueblo has done a fantastic job of bringing Hernandez along. He’s a budding star in Mexico already and will likely be the next Mexican sensation to crossover to the states. Look for Hernandez to challenge for a world title within a year. Ennis is looking to become Philadelphia’s next world champion. In his last outing, he disposed of the highly durable, Mike Arnaoutis inside of two rounds. He’ll challenge unbeaten Armando Alvarez for the vacant WBC United States Middleweight title. Ennis is becoming a household name on the east coast, fighting from Virginia to New Jersey. He’ll take his talents to Sloan, Iowa on July 20th. It will be televised on Showtime, giving Ennis the opportunity to shine for a live national audience. Haney is being billed as the next Floyd Mayweather; he’s young, flashy and talented. He’s quickly rising through the ranks, embarrassing Mason Menard in his last outing. The ultra-talented Haney has built his career and reputation from ground zero with no help from a traditional promoter or manager, something that is extremely rare in the sweet science. He’s recently crossed over to the mainstream media as he is rumored to be dating Rob Kardashian’s baby momma, Blac Chyna. Whether that proves to be detrimental to his career, there’s no denying just how talented Haney is. With his confidence, we could see Haney challenge a world champion or major contender within a fight or two. Munguia stunned the boxing world with a one-sided destruction of Sadam Ali to capture the WBO Jr. Middleweight title. Now, he’ll defend his title against former WBO Champion Liam Smith. Against Ali, Munguia was a wrecking ball as on-lookers actually feared for the safety of Ali. All eyes will be on Munguia next Saturday night in Las Vegas, NV. Is Munguia a one hit wonder, or his he the truth? We’ll find out a lot more about the kid from Tijuana. But from the looks of things, Munguia is ‘the goods’ and there isn’t a wall that could hold him back from conquering the Jr. Middleweight division. One word, MONSTER!!! Benavidez burst onto the scene in 2017 with a thrilling combination knockout of Rogelio Medina. It was sensational, explosive and a thing of beauty all in one. He captured the WBC Super Middleweight title with a split decision over Ronald Gavril, and defended it in a rematch victory against Gavril. In the rematch, Benavidez picked apart Gavril while winning every round. Recently, Benavidez has been in a promoter lingo. He recently signed with Top Rank and received a $250,000 signing bonus. Fearing legal repercussion from his current promoter, Benavidez returned the signing bonus and returned to Sampson Lewkowicz of Sampson Boxing. Hopefully Sampson doesn’t shelve Benavidez as a punishment of sort, Benavidez is a hot commodity among fans, and his light couldn’t shine any brighter as it is right now.